steel tank has a 21 foot 6 l/2-inch-inside diameter and is 8 feet 1/2 inch high at the sidewall. SIDE STAVES. - The side staves consist of 14 curved, vertical sections, arranged in a single ring. The staves are chimed (flanged) at the top and bottom of each section with the left end of each chime offset so the vertical seams overlap. The bottom chime bolt holes are patterned to match the outer edge bolt holes in the tank bottom. The vertical seams have one row of bolt holes. SPECIAL SECTIONS. - The tank bottom has one special section, fitted with a blind opening. Five of the 14 staves are special sections. One section is for a cleanout cover, and the other four sections are used for pipe connections (fig. 9-6). The tank deck has three special sections. Two sections are used for a thief hatch and relief valve, and one section is used for a liquid indicator. EMERGENCY VENT. - Each tank is equipped with a 10-inch emergency vent, bolted to the top cover of the manhole attached to the top of the center ladder supports. ERECTION OF A 500-BARREL TANK Although similar in design and construction, bolted steel tanks differ mainly in the number of parts required for each different size tank. Therefore, the erection procedures for the 500-barrel tank, described here, can be applied to the other tanks regardless of size. The center bottom plate (fig. 9-7) is a circular, flat steel plate. The tank bottom plates are attached to the outer circumference bolting circle. Before installation of the center bottom plate, make sure that it is not warped or broken. Check the bolt holes for bolt clearance. Clean the bolt holes of dirt or other foreign material where the center plate gasket is applied. Drive the center stake below the surface of the foundation and backfill the hole. Place the bolt-retaining boards around the outer circumference of the plate. Position the plate over the center stake. 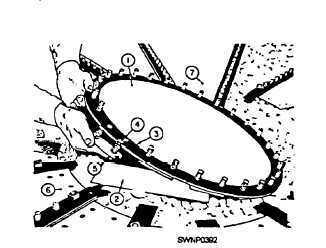 Place the gasket around the bolt circle of the center bottom plate. Insert two 1/2- by 1 l/2-inch bolts in the two bolt hole channel. Figure 9-7. - Installation of the gasket the bolts, and the channels on the center bottom plate. Figure 9-6. - Layout of the staves around the tank bottom, 500-barrel capacity tank.